Heat olive oil in a large skillet over medium heat. Saute shallots until they begin to brown. Add garlic and mushrooms, and cook until tender. Deglaze pan with brandy, and season with thyme, parsley, salt, and pepper. Remove from heat, and allow to cool. In a large bowl, combine egg, milk, Swiss cheese, cream cheese, and bacon. Fold in mushroom mixture. Spoon evenly into phyllo cups, and place cups on baking sheet. Bake in preheated oven for 15 to 20 minutes, or until filling is set. Pretty good, but next time I will add more Swiss cheese, cream cheese, and bacon. This recipie is absolutly wonderful as written I have made these several times and I always get rave reviews. Perfect appertizer or even fancy football food which is when I usually make them. Not my favourite appetizer. I brought them to a party and no-one asked for the recipe. I will look for another use for my mushrooms next time. 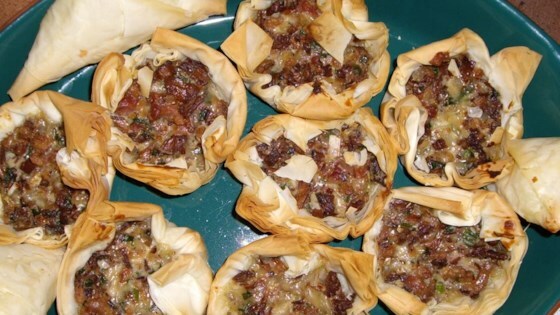 I thought the tartlets were delicious but next time I planning to add sausage and cut the mushrooms in half. I am not a fan of swiss cheese, so I substituted Gruyere. Also didn't have any brandy, so I used a Chardonnay. The tartlets were amazing and I got loads of compliments.